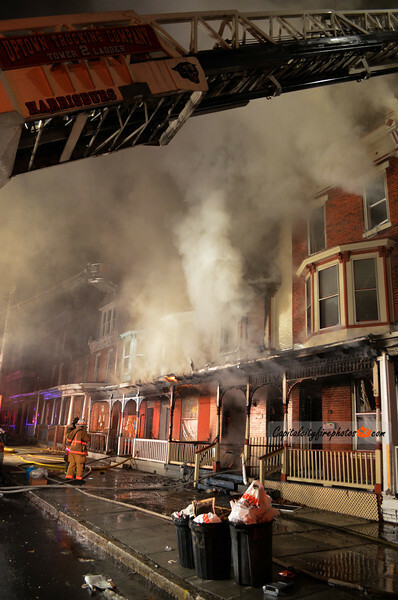 Harrisburg, PA - At 0558 hours Box 1-3 sent Wagon 3, Tower 2, 1, Squad 8, and Captain (Miller) to 2128 N. 4th Street in the city's Uptown neighborhood for a structure fire. Reports indicated several calls received and PD on location confirming a working fire with possible entrapment. Captain 2 requested the first alarm assignment enroute. Wagon 3 and Tower arrived with heavy fire showing from the first and second floors of a 3 story, middle of the row, dwelling spreading to the exposures. Companies led off with the deck gun from Wagon 3 to darken down the heavy fire showing on side A. Captain 2 reported he had 3 homes involved and called for the second alarm assignment bringing county mutual aid to the scene. Multiple hand lines were advanced into the exposures along with a 2.5 inch line to the rear. An interior attack on the fire building was deemed unsafe due to a collapse of the second floor. Firefighters battled the fire for about 30 minutes before conditions improved and crews were able to contain the blaze. The fire displaced several residents and damaged at least 5 homes. Companies from Steelton, Susquehanna Township, Paxtang, West Shore Bureau of Fire, New Cumberland DLA, and Paxtonia assisted city crews at the scene.